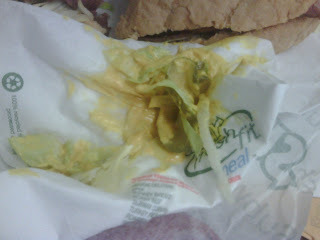 why does subway feel the need to pile the mustard on my sandwich there? i talked the boys (aka the crew i'm working with in richmond) into walking the 6 blocks or so down to subway at lunch today...subway club = yum. anyways, i always get 12 inch subway club on wheat, with no cheese, with mustard, pickles, and lettuce. they always decide to give me enough mustard for 3 sandwiches. hehe. i grabbed extra napkins, and scraped off what i didn't need and am now enjoying the sandwich. i think i forgot to mention that daniel met me in bowling green on sunday. this was on my trip home from nashville. i hooked him up with the new dmb tee i bought him in nashville - 2xl, looking so good on my boy!!!! - and we ordered pizza and hung out. it was so nice getting to spend some time together. my new garmin kinda rocks. it's a lot nicer than i expected. it speaks all street names, tells me how fast i'm going on the main screen, tells me the speed limit of the road i'm on, and puts what side of the road my turn is in the mile countdown. i kinda love it. i'm going shopping tonight. i'm in desperate need of some spring/summer work clothes. mandi's momma gave me a lane bryant gift card for christmas, plus i have an exchange, plus another gift card, so i think i can go in, buy a decent amount of clothes, and not spend a huge sum of money. that's huge, because typically i spend wayyyyyy too much in there. i worked out last night...felt so good. hated that i could tell a big difference in where i am now from where i was last time i worked out. started the jogging program again, but had to back up a week on it. hoping to see a big improvement over the next week or so, though. it's biggest loser night! :) why does this excite me so much? i think it helps keep me motivated....oooh, and alison sweeney said in a tweet this morning that it's an excellent episode. fingers crossed for tara in the final four! bye, bye ron! I miss subway... none local! I am SO pissed that Ron is still on! Oh poor Filipe. He and Sione were so sweet. I was hoping one of them would make it. Helen annoys me, she should have left and let her daughter stay. Tara better win. Mike is too cocky. Tara looks like a completely different person. Maybe we will too one day.